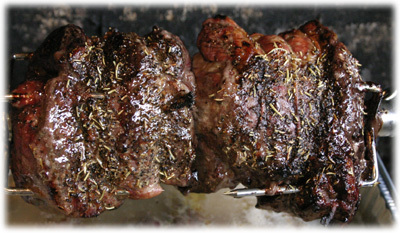 Picanha (pronounced pee-Con-ya) has become one of the most popular dishes at Brazilian BBQ restaurants, called Churrascarias. The name given to cooking or grilling meat in Brazil is Churrasco and this beef recipe is among the favorites. The pieces of beef are skewered and slowly cooked over flaming charcoal. 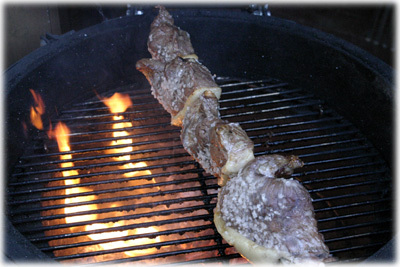 As the thick fat begins to melt and drip over the coals the smoke and flames add incredible flavor and seal in the meat. 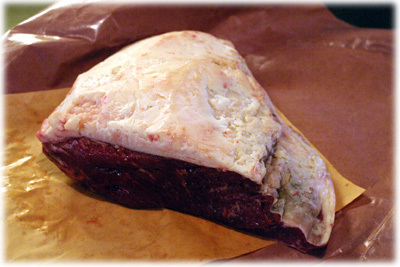 The cut of beef used comes from the rump of the cow and includes a thick cap of fat that stays on while cooking to keep the meat moist and flavorful but isn't eaten. 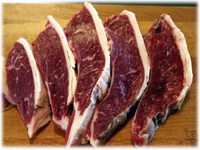 This cut of beef is inexpensive and goes by several different names in North America. When asking your butcher for it try asking for "cap of top sirloin" or "rump cap". 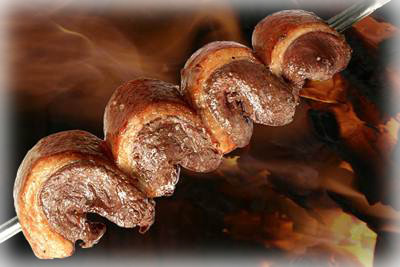 Brazilian restaurants or churrascarias are becoming increasingly popular across the US and Canada but this style of cooking and the various names and cuts are still new to many people, butchers included. Ask for the cut of beef from the top of the rump opposite from the Tri-Tip. Your butcher may be comfortable calling it "cap of Top Sirloin". This piece of meat won't be very large, maybe 3 lbs or so. If it's larger than that you're likely getting more of the rump that extends further down and is tougher meat. 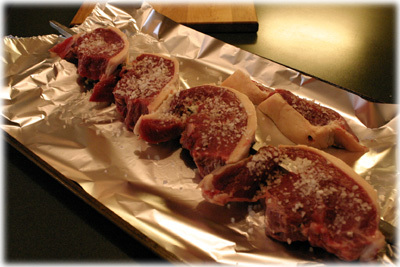 Use only thick, coarse salt like rock salt or Sea Salt when seasoning the beef. Table salt and even Kosher salt is too fine grained to work well and only makes the meat too salty tasting. Picanha is best cooked over charcoal but if using gas make sure you're ok with the fat dripping down on the flames. 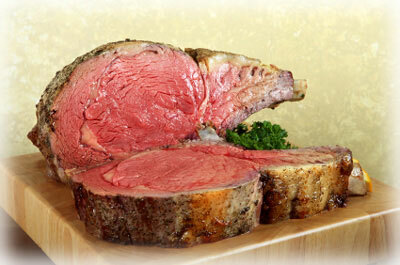 This fat melting, smoking and flaring up is what gives the beef extraordinary flavor. 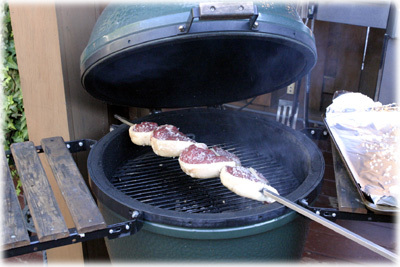 I just use a bare rotisserie rod to skewer the meat on, see below. This works very well. 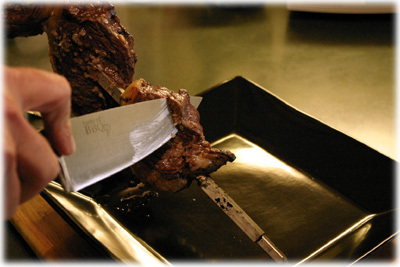 When cutting the picanha to be skewered make sure you cut against the grain. Interestingly, after it's cooked you'll be slicing it off the skewer along the grain. This is best eaten and served for very laid-back, informal and slower-paced meals. You'll be slicing small slivers of the cooked beef onto your guests plates and putting the beef back over the flames to stay warm and sear the beef further. Lay the meat on a cutting board fat side up. With a very sharp knife cut the meat in 1 1/2" to 2" slices across the grain. Insert the skewer or rod into the fat side of the picanha, through the meat and back out the fat side. Repeat this for each sliced piece. Sprinkle each piece with rock or sea salt and let sit for 1 hour. Light the charcoal and let it become fully engaged and start developing a light ash coating while the meat rests. When the coals are ready lay the skewer of meat across the BBQ and keep the lid slightly open. Every few minutes rotate the skewer slightly so all sides of the meat cook evenly. Notice that as the fat melts into the coals delicious smoke and flames add flavor to the meat. When the exterior of the meat is cooked and has a nice shiny charred appearance it's time to start slicing off thin slivers of meat for your guests. 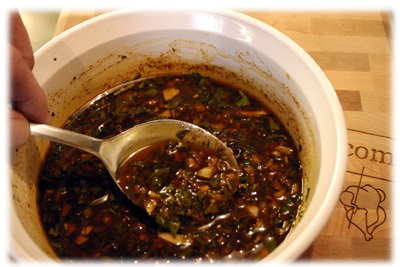 This is good served with this Chimichurri sauce recipe on the side. 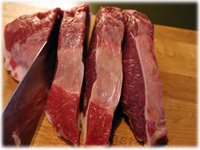 Notice how you'll be slicing with the grain and the meat remains tender and juicy. If there is meat remaining on the skewer place it back over the BBQ to char up the newly exposed exterior.